Hi there! Happy Monday! 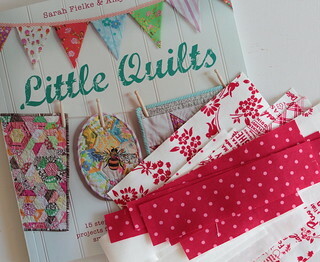 It's Little Quilts day here again, this time I'm here to announce the winner of the book. It's Cynthia who said "Here's my advice....all you need to do, is make a cute vintage mini out of your gorgeous fabric and your swap partner will be overcome with joy!!! " Cynthia, email me and let me know your address so that Cico can send your book! I sure appreciate all your advice, and I enjoyed all your comments. I hope you'll all head over to see Nedra today, it's her turn on the Little Quilts hop! What did you do this weekend? We had a nice busy weekend, those are always fun. It's hot here still, high 90's both days, yikes. Man mother nature sure is sending me mixed messages with the heat and the amount of fall leaves in my backyard. I don't know what to make of it. I have my little quilt mostly cut out, I can start assembling it today. I'll let you know how it goes! Had a fun weekend too! We went off to Chicago where it was 47 on Friday. I had ready forecast of mid 60s and and only had a sweater. Oh so sad, I had to go shop for a little jacket. Looking forward to seeing your project Pam.